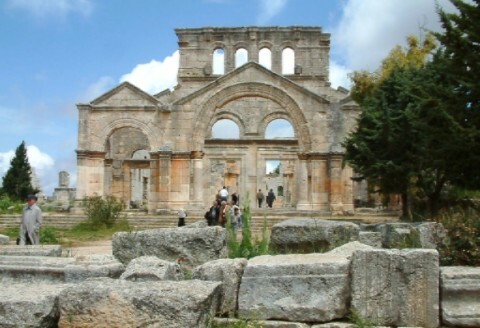 On December 14 2015 the DGAM issued an update on the situation in the countryside near Aleppo, addressing damage to St. Simeon’s Basilica, centre of the World Heritage site, Ancient Villages of Northern Syria. See the full report here. Syria Direct examines the ‘slow destruction’ of the citadel in Aleppo, also part of a World Heritage site on November 25 2015 here. On December 13 2015 the DGAM reported a mortar strike on the 16th c. Tekkiye Mosque in Damascus. For details, see here. Daesh destroyed the grave of Mariam Bint Qasim, wife of Sunni Sufi Shaykh Mohammad al-Nabhan (born 1900-1974) in old Aleppo, Syria, according to Save Muslim Heritage, who have posted photos here. The Director-General of the DGAM, Maamoun Abdulkarim, alleges on December 11 2015 that Turkey holds looted Syrian artefacts which it is now refusing to return. See here. Neil Brodie, for The European Union National Institutes for Culture, discusses policy possibilities to fight Daesh’s revenues from antiquities trafficking here. A recent article (in German) discusses how ‘headlines move faster than research’ when it comes to the reporting of antiquities theft and dealing. See it here, and also a summary discussion in English at Conflict Antiquities here. On December 4 2015 The New Yorker considers the ‘real value’ of trafficking antiquities for Daesh. Sam Hardy offers an update on the recent seizure of artefacts in Turkey reportedly from the Palmyra museum, suggesting that the artefacts are in fact fakes here (see also here). Additional discussion on this problem in general can be found on Conflict Antiquities here. Reports are surfacing from UNESCO Sweden of a seizure in Sweden of Syrian artefacts looted by Daesh. For discussion and commentary see here. Syria’s Intangible heritage finds a way to survive. Aleppean soap is often made according to traditional family recipes, but many of the factories are now destroyed. Read how these women are keeping the tradition alive here. The Director-General the DGAM, Maamoun Abdulkarim, is calling for global help to save Syria, specifically to “elevate the mission above the messy fray of regional politics and into the international sphere” and “join forces with the opposition and fight an “international war” against Daesh. See the National Geographic article here. In November, Dr Mamoun Abdulkarim gave his first talk in the UK as part of the World Monuments Fund programme on endangered heritage. Watch the video of Syria’s Battle to Protect its Past here. Representatives from the DGAM attended the 29th General Assembly of the International Centre for the Study of the Preservation and Restoration of Cultural Property (ICCROM) between the 18th and 20th of November. See more here. The Director-General of the DGAM, Maamoun Abdulkarim, took part in a conference in Vienna on December 10 2015 organised by ICOM Austria, “Cultural Heritage under threat in context of War and Refugee-Crisis in Syria and Iraq: Can Palmyra still be saved?” see further details here. Fusion examines online efforts by researchers to track and halt the trafficking of ‘blood antiquities’ here. The Antiquities Coalition offers an update on the keeping of inventories and documents here. On December 11 2015 an international summit was held at the National Geographic Society in Washington DC under the title “Protecting our Shared Heritage in Syria – an international summit to promote collaboration”. For information see here. The programme brought together many major institutions working in heritage protection to encourage sharing of information and reduce duplication. Between December 3 and 6 The International Syrian Congress on Archaeology and Cultural Heritage was held in Beirut. Details of the programme can be found here. On 16th December, the Iran Heritage Foundation hosted the ‘Destruction of Monuments and Memory in the Middle East’, which included a talk by Dr Emma Loosley on Syria, in addition to representatives from the military and the Art Dealers Association. Details are available here. The European Parliament met on Wednesday 25 November 2015 too exchange views on the destruction of Syrian and Iraqi cultural identity. Speakers included the Association for the Protection of Syrian Archaeology, who have shared the draft agenda, here. ‘Mutilated Mnemotopes – Why ISIS Destroys Cultural Heritage Sites in Iraq and Syria’ – a paper by Eckart Frahm, can be found here. The Asia Society has posted the the video of Dr. Amal Marogy’s lecture “Why ISIS is Destroying Syrian Cultural Heritage” (1hr, 5 mins). Cultural Heritage Initiatives has released weekly report 61/2 (September 30-October 13 2015) here, report 63-4 (October 14-October 27 2015) here, and report 65-6 (October 28-November 10 2015) here. On November 30 2015, London Mayor Boris Johnson, together with representatives from the UK police, UK National Committee of the Blue Shield, UNESCO, and academia, announced his intention to safeguard looted artefacts pending their repatriation to post-conflict regions. For more information, see here. On December 4 the French finance minister called for tougher controls on the trafficking of stolen art. See the Telegraph article here. European governments call for strong actions against illegal dealing benefiting Daesh after a meeting on December 8 2015. See articles from The Local here and BFM TV here. CNN on December 12 2015 looks at funding for Daesh, including from antiquities smuggling here. Bill Caraher talks about Daesh looting in his Archaeology of the Mediterranean World podcast on December 3 2015 here. On November 30 2015 The Economist examines the link between ‘culture and jihad’.